As an author, Matthias Pogoda works for the Peerverlag publishing house. 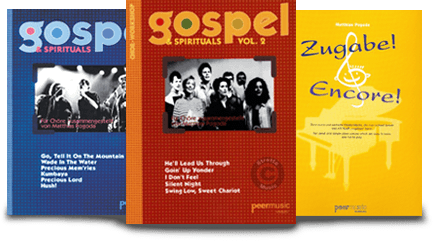 Gospel & Spirituals Vol. and Vol. 2 are bestsellers at Peer Publishers! The simple choral settings and the demanding piano accompaniment promise an authentic Gospel feeling. The titles have been performed repeatedly and with great success. The ten short pop piano pieces in Zugabe! are “well crafted, gorgeous and full of atmosphere”, writes piano teacher and composer Sandra Labsch in her blog “From my Music Shelf”. The pieces have been performed many times! Zugabe! is meant for advanced players, both youth and adults.